Blue & Orange: March Cancer Awareness! This month, we are happy to be supporting two very different types of cancer. March is dedicated to Colon Cancer Awareness Month and Kidney Cancer Awareness Month! Colon cancer affects your large intestine (or your colon). Often, you may hear people say that March is also Colorectal Cancer Awareness Month. Colorectal cancer just refers to the combination of colon and rectal cancers. Unfortunately, with colon cancer, symptoms are not typically experienced in the early stage. This is why there is a push for regular colon screenings! It is a very treatable disease, but only when caught early enough. One of the biggest advocates for colon cancer is Katie Couric! She is widely known for serving as an anchor on NBC News, but is currently working as an anchor for Yahoo Global News. She is also one of the founders of Stand Up to Cancer, a cancer research organization that we regularly donate proceeds of our jewelry sales to. 18 years ago, her husband, Jay, was diagnosed with colon cancer. He eventually passed away, which made Katie completely rethink her life’s purpose. She has decided to make it her life’s work to fight to find a cure for all cancers. She says, “This work has given my life real purpose, and I’m often reminded how important it is.” You can learn more about her story here. We are so grateful to be able to use our similar mission to support hers. Kidney cancer, on the other hand, is caused when kidney cells grow substantially and become cancerous. Like most cancers, when caught early, it can be treated with great success. Yet, these tumors often grow too large before they are even detected. For Kidney Cancer Awareness Month, we have designed and created a special bracelet for kidney cancer. This bracelet was crafted to both honor cancer warriors and celebrate cancer survivors. Every bracelet sold donates 50% of proceeds back to Stand Up to Cancer! You can either purchase one in honor of your own cancer journey or give it as a special gift of hope to someone you know who has been affected by cancer. Shop for a cause here. But don’t wait – this bracelet will only be available until the end of March. Make sure you follow us on Facebook, Instagram, and Pinterest this month! We are giving away special discount codes that you can use on our online store all month long. You don’t want to miss these deals! We are still full of love and inspiration from last night’s Unite4: Humanity event! We hope you followed us on Twitter to see live updates and pictures from the event. If not – don’t worry! We’re dedicating this blog post to recapping our experience for you. And, admittedly, we’re also excited to have a reason to relive these memories and special moments. The event was held at the Beverly Hills Hotel in California. 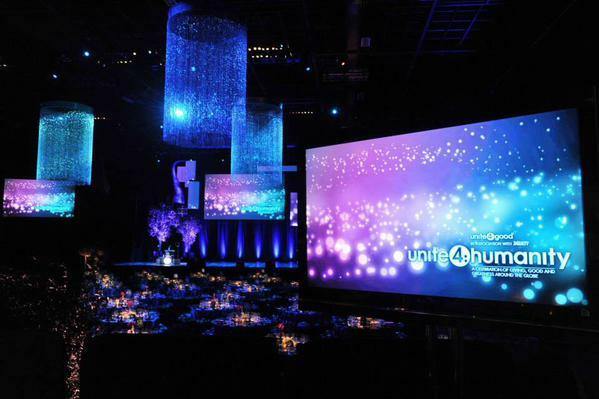 The unite4: good foundation and Variety are responsible for the event and for choosing the honorees. 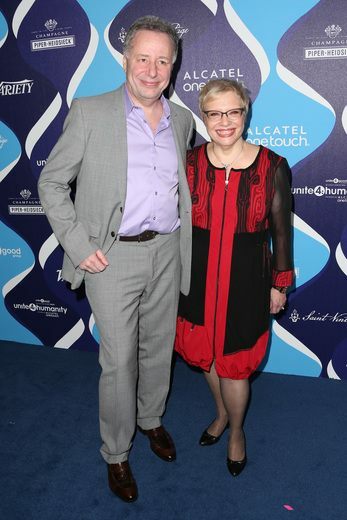 unite4: good’s Founder Anthony Melikhov (pictured below with Executive Director Dr. Leslie Morrison Faerstien) have made it their mission to empower individuals to give back to their community; this event, specifically, honors exemplary heroes and leaders in the entertainment industry who have used their influential voices for good. The location (pictured above) was beautiful! We were able to watch the celebrities arrive and even had an opportunity to talk with them before the awards were presented. 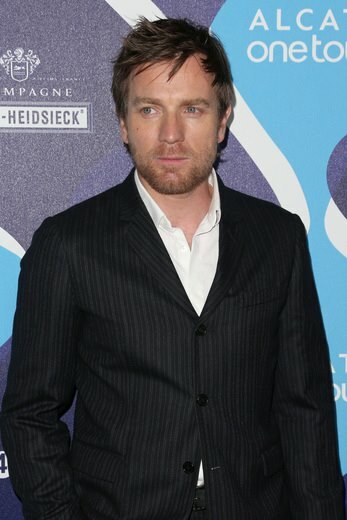 The seven honorees included Aaron & Lauren Paul, Halle Berry, Josh Hutcherson, P!nk, Ewan McGregor, and Christina Applegate. There were so many emotionally-charged speeches throughout the event. We got to hear from celebrities like Amy Poehler, who spoke out about her friend and colleague Harris Wittel’s recent passing due to a drug overdose. But the most exciting part of the night was presenting our own award, the Saint Vintage Love Cures Award, to Christina Applegate for her work with Right Action for Women. Christina is a breast cancer survivor, so she has made it her mission to raise awareness and take action against breast cancer. As you know, SV Founder Paige Jansen-Nichols is also a 2x cancer survivor, which made this ceremony even more special. This was the first time we presented this award and we couldn’t have found a better, more deserving candidate. Here are some more pictures from the event! We got to hang out with P!nk, Halle Berry, Queen Latifah, and even Sarah Hyland! 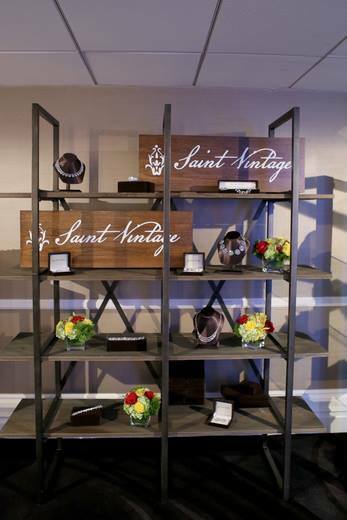 We even got to display some of our current and NEW Couture pieces from our special Saint Vintage Collection! 50% of proceeds from every accessory sold is donated to various cancer research organizations. To see even more updates and images from the event, check out our Facebook! We were so thankful to be a part of this event and can’t wait to see what the future holds! New Ways to Sparkle in 2015! As if 2014 wasn’t busy enough, we are bringing you EVEN MORE in 2015! We know we’ve said it before, but we truly wouldn’t be able to carry out our passion for helping those affected by cancer if it wasn’t for your generosity & love for spreading cancer awareness in style! Last month, we told you that, with your help, we were able to donate over $100,000 dollars to cancer research organizations! $50,000 of that was from our special Love Cures collection that went to Stand Up to Cancer! BUT… this year we want to do even more! After all… New Year means New Beginnings! And we are excited that you will be a part of it! 10% for first time shoppers. That’s right, for all of you who have not gotten a piece of Saint Vintage sparkle yet, now is your time! Not only will you receive a discount on your first purchase, but you will be helping us to reach our milestone of donating $200,000 to cancer research! Keep an eye out for the posts with the discount code! Do you do anything to help spread cancer awareness? This could include painting your nails a color for a certain cancer, running/walking in an event to raise money, or even dying your hair a color of a cancer awareness ribbon! We’ve seen it all! But we want to see more. Take a Raise Awareness Selfie, upload it to social media, and tag Saint Vintage in your post! Just for doing that, we will give you 10% off your next jewelry purchase! While we’re talking about selfies, next month… if you take a SV selfie wearing our jewelry and tag #SaintVintage in your post, you will get 15% off your next purchase! We can’t wait to hear from you in 2015! Make sure you follow us on Facebook, Twitter, Instagram, and Pinterest so that you can stay on top of all these special promotions! Cervical Cancer is a cancer that forms in the tissues of the cervix. It’s typically slow-growing, which, unfortunately, means it may not produce any symptoms. For this reason, doctors recommend that women regularly get a Pap test. This procedure is one of the only ways that cervical cancer can be detected. Statistics: In 2014, about 12,900 new cases of cervical cancer will be diagnosed. Out of those 12,900 people, 4,100 women will die from cervical cancer. Cervical cancer was one of the most common causes of cancer-death for American women this past year. But there is good news! Over the past 30 years, the death rate has gone down by more than 50%! When are you at risk? This type of cancer typically develops around midlife, most cases being found in women who are younger than 50. However, 15% of cervical cancer can be found in women over 65, so it is important to get regular tests to screen for cancer. Risk Factors: Like any cancer, these risk factors can greatly decrease your chance of developing cervical cancer. However, individuals who do not engage in any of these risk factors still have a chance of being diagnosed. Some risk factors include: many sexual partners, early sexual activity, STDs, a weak immune system, and smoking. In 2014, we raised over $100,000 for cancer research – $50,000 of that going to the Stand Up to Cancer Organization. In 2015, we want to increase that number to $200,000 so that we increase the chance of finding a cure for cancer! The color of cervical cancer awareness is teal. To honor cervical cancer fighters, survivors, & warriors, we have created a special Cervical Health Awareness Month original teal bracelet that you can purchase from our online store. When you purchase this bracelet, you are supporting cancer awareness! 50% of proceeds are being donated to various cancer research organizations that are working hard to find a cure. Check out some of our other teal jewelry found in our online store! Let’s conquer cancer together, improve the lives of those affected by cancer, & beat cancer so that others won’t have to experience this terrible disease! Follow us on Facebook, Twitter, and Instagram to show your teal support for Cervical Cancer Awareness Month! If you take a Raise Awareness Selfie and tag @SaintVintage in your post, you will get 10% off your next jewelry purchase! ‘Tis the season to give back! One thing we love about the holiday season is the reminder it brings to stop thinking about ourselves and, instead, focus on the important people in our lives. This time of year, we want to show them our love and gratitude by gifting them something special. Whether it is your mom, grandma, neighbor, or best friend – Saint Vintage jewelry is designed to make them feel glamorous while also giving back to cancer research. When you give a gift of our jewelry, you are also giving a gift of hope for people diagnosed with cancer. Our philanthropic jewelry has been recognized on so many Holiday Gift Guides this year and we are so thankful for the support! If you are still searching for that perfect accessory for your someone special, check out these gift guides! The beautiful Giuliana Rancic featured our Big Buddha Love Cures on her Gift Guide! Any mother would love to receive a token of love and luck for the holidays! And she will be so proud when she finds out that 50% of the proceeds are donated to Stand Up to Cancer. Read/watch Giuliana’s holiday recommendations here! US Weekly has always been the trusted go-to guide for style and fashion. Need help deciding on a holiday party outfit? They have you covered! 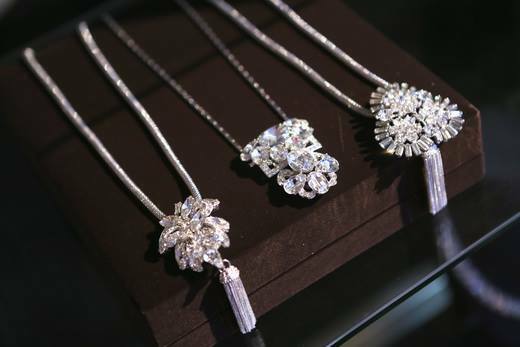 Our Crystal Fleur Love Links made it on their top 4 list of the sparkliest accessories to pair with your festive look! Check out their full list here! Give a gift AND give back with the gifts on this list! We were number 1 on DIY Fashion’s list of accessories that make a difference! Read the list online here and check out the other companies using their products to make the world a better place! Shop our philanthropic jewelry collections here. The Effortless Girl blog dedicated an entire post to our jewelry! We are even offering a special discount for her readers – read her blog post here to get the special code and get an additional 15% off your purchase! *Today is the LAST day to order jewelry if you want to use FREE standard shipping with code FREESHIP to get it in time for the holidays! 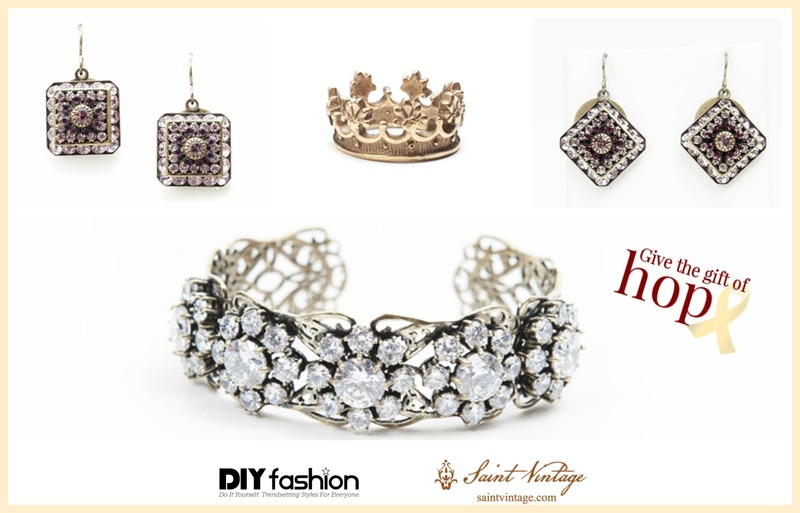 Want to see more gift ideas from Saint Vintage? Follow us on Facebook, Twitter, and Instagram! We can’t wait to see picture of you or your loved ones wearing our jewelry after the holidays! Tag #saintvintage to show off your sparkle!